What is a "suckout" in the game of poker? What is the definition of the term "suckout" in poker? 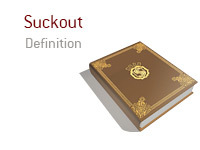 In poker, a "suckout" is a slang term for when somebody comes from far behind to win a hand. Let's take a look at an example of a "suckout". You are playing in an online No Limit Hold'em cash game. You are in early position and are dealt pocket Kings. You put in a standard 3x raise. Action folds around to the button, who decides to re-raise all-in. The SB and BB both fold, and you elect to make the call. The button sheepishly turns over 8d-7d and you are looking great to win the hand. The flop comes Kd-2c-3s, and your Set of Kings is way, way out in front. The turn brings the Ad, which gives your opponent some outs as he now has a flush draw. The river? The 6d, which gives your opponent the flush. Your opponent has "sucked out" to win the hand, as his hand was inferior to yours on every street except the river.